Looking for a reptile that is ideal for beginners? Enter the world of leopard geckos! It is small and easy to handle, making it an excellent choice of a pet for those who are inexperienced. They are docile and friendly, so there is no need to be an expert to learn how it is handled. It also requires minimal care and maintenance. If you plan to have a leopard gecko as a pet, keep on reading and learn from some of the valuable insights we will be sharing. The average size of a leopard gecko is anywhere from eight to ten inches. There are some, however, that can grow as much as 12 inches. A male leopard gecko generally has a bigger build. Their heads are often broader, and their legs are bulkier. The underside of the tail will be indicative of the gender of the gecko. The femoral pores are larger and more visible in the males. Its color will usually vary depending on its stage of development. In the case of adult leopard geckos, their body is predominantly yellow with dark brown spots. At the bottom, they are white. When they are younger, on the other hand, they have a yellow band and a dark brown body. This color fades as they grow older. One physical characteristic that differentiates it from the other geckos is the presence of eyelids. Leopard geckos are known for being nocturnal. They are also docile, and they can tolerate handling, but be careful and avoid making them feel threatened. If they are frightened, they will drop their tail. They are easy to tame, move slowly, and usually do not bite. These geckos are also ground-dwelling and they do not have sticky pads in their toes. Meaning, they are unable to climb on walls. Leopard geckos are also perky and vocal. It will easily show if they need anything, such as when they are hungry. Another thing that a leopard gecko usually does is that it rattles its tail, which is usually an indication of excitement, such as when it is thinking of mating. Generally, leopard geckos are small, so you do not need to have a large housing or enclosure. The right size will depend on how many geckos you plan to put together in a tank. Because they are well-behaved, there is no problem even if they cohabitate. Generally, a 15 to 20-gallon enclosure will provide enough space for up to three leopard geckos.
. Hide boxes such as the latter will be important because leopard geckos are nocturnal and shy in nature. will be great if you want leaves that look realistic. They are great because they are non-toxic.
. While it does not produce light, it produces heat to maintain the right temperature of the cage. Leopard geckos are known for being insectivorous. Some of the foods that they enjoy eating include crickets, superworms, waxworms, mealworms, and cockroaches.
. This will provide them with an easy access to clean drinking water and will keep them hydrated. When feeding insects to leopard geckos, it is important that they are gut loaded for about 24 hours. It will also help if they are coated with a calcium or Vitamin D3 supplement, which will provide the vitamins needed by the gecko. 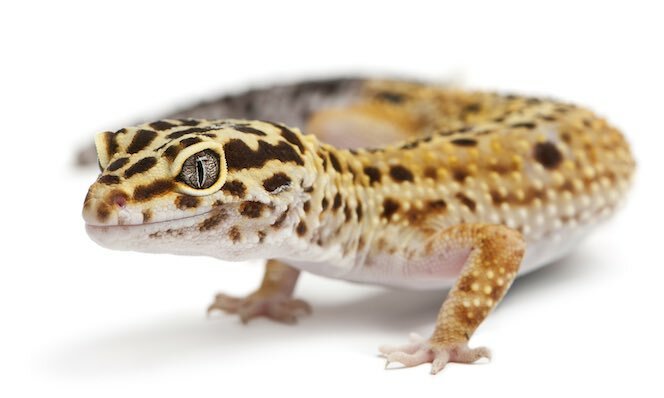 While leopard geckos are easy to take care of, they can also be prone to health problems. One of the conditions that can be a burden is metabolic bone disease, which is an outcome of not having enough calcium and Vitamin D3 in their diet. It is also not uncommon for them to suffer from bacterial infection, which can lead to gastroenteritis. Some of the most common indications of this health problem include unusual shrinking of the tail or the presence of watery stool. Pneumonia and other respiratory problems are also often common among leopard geckos. To trigger proper shedding, it is important to monitor the humidity in the cage. A moist hide box can help. To keep the box moist, it will be good to add paper towels or moistened peat moss. Take note that leopard geckos are ectothermic. This means that the body is not capable of producing its own heat. This makes it important to include a heat source in their captive habitat. Provide a dish for water and for food. Avoid dropping the food in the enclosure as this can cause a mess. While it is alright to house multiple leopard geckos in one enclosure, it is not advisable that there are two males living together as they are known for being territorial.